We have developed a comprehensive searchable database of engineering drawings, dating back to the early 20th century, accompanied by high-resolution, large-size TIF images. The project is a work in progress, and there are currently over 8500 records available to search. Care and feeding of the major telescopes and instruments on Mt. Hamilton. The Shane AO/IRCAL System, an upgrade of the Lick 3-Meter Laser Guidestar Adaptive Optics system, is a diffraction-limited imager and spectrograph designed for astronomical observations in the J, H, and K near-infrared bands using the Shane 3-meter telescope. The system uses adaptive optics for correction of atmospheric image blur and a high-sensitivity infrared science detector sampled for diffraction-limited observations. The illustration shows the system from above, showing lightpaths in light yellow (click to enlarge). 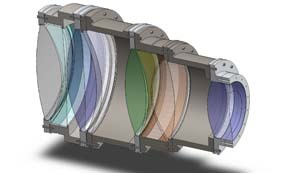 The Keck I Deployable Tertiary Mirror is a deployable tertiary mirror for the Keck I (K1) telescope. It will provide a 5' field-of-view (FOV) to any Nasmyth port, satisfying the observational needs of all current and planned instrumentation on K1 at this focus. Ideally, this mirror will shift between states (stowed, deployed) in less than 15 minutes and provide observations with any K1 instrument on any given night. Keck Cosmic Web Imager (KCWI) is an integral-field spectrograph optimized for precision, sky-limited spectroscopy of low-surface-brightness phenomena. KCWI will feature high throughput, and flexibility in field of view, spatial sampling, bandpass, and spectral resolution. KCWI will cover the optical spectral regime using optimized blue and red channels in a manner similar to LRIS. quasars, and glowing gas surounding the first stars. The Lick Instrument and Optics Shops are engaged in efforts to refurbish the historic 12" refracting telescope. 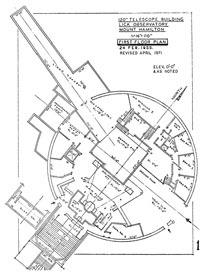 Installed in the dome which now houses the 40" Nickel telescope, the telescope utilized best-of-class optics made by famed lensmaker Alvan Clark. He considered the objective lens he made for the telescope to be one of the best he ever made. He and his sons went on the make the lenses for the 36" refractor, the largest in the world at that time. First used by Lick astronomers to observe Mercury's transit of the Sun on November 7, 1881, the 12" was the main telescope on Mt. 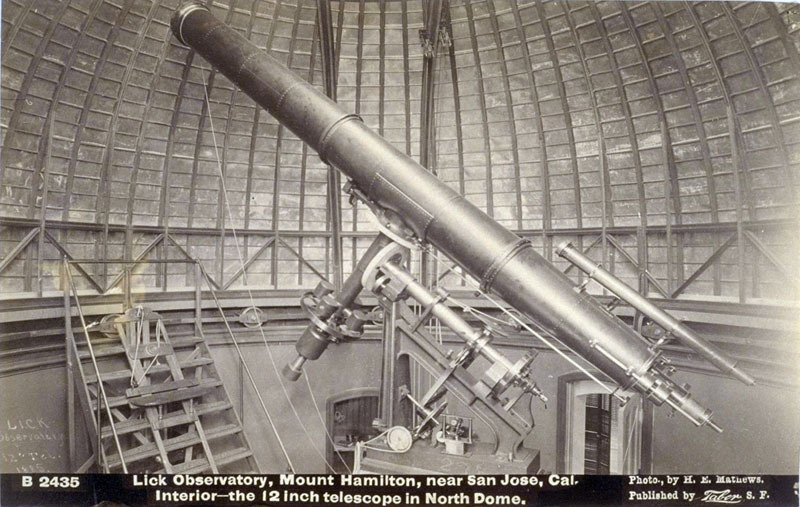 Hamilton as the great 36" refractor and its dome were being built. It has gone unused for many years, and it will now be restored as an important part of Lick Observatory's history. The goal of this project was to replace the existing CCD in the red side of LRIS with a 2 x 1 mosaic of 2k x 4k fully-depleted LBNL CCDs to increase the sensitivity of the red channel of the instrument and eliminate fringing. Other improvements include a modest increase in spatial and spectral coverage, improved image uniformity due to a flatter detector, and increased reliability for the detector readout electronics. First light achieved on June 7, 2009: M51 - Whirlpool Galaxy. 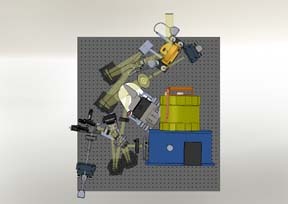 The Low-Resolution Imaging Spectrograph on Keck-1 provides imaging and spectroscopy from the ultraviolet (3100A) to near-infrared (1 micron). Unfortunately, atmospheric refraction, acting much like a prism, results in a displacement of an incoming beam that depends on wavelength and zenith distance. This atmospheric dispersion, even at modest zenith angles above 60 degrees, can seriously reduce slit throughput if the position angle of the slit is not perpendicular to the horizon. To correct for this problem, an Atmospheric Dispersion Corrector (ADC) has been built. 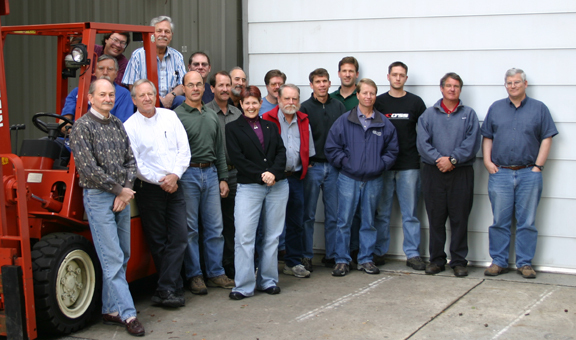 First light was achieved on January 27, 2007, and commissioning completed in March 2007. HIRES - High Resolution Spectrograph Dewar Upgrade on Keck I: The new system replaced a single CCD using 24 mm pixels with a mosaic of three CCDs, using 15 mm pixels each. Consequently, this upgrade provides not only a 130% increase in area of the CCD detectors, but also significantly increases the resolution of the pictures obtained. First light for the new detectors was August 2004. TV Guide Camera - UCO/Lick Observatory has produced new field acquisition and telescoping guiding cameras to replace the existing guiders on Mt. Hamilton. This instrument is a two-beam spectrograph that has been installed on the right Nasmyth platform of Keck-II. Presently only one beam is operable. First light was June 2002. This spectrograph is a Cassegrain instrument that is being used on Keck-II. First light was achieved in August 1999. The high resolution spectrograph is currently the workhorse instrument on Keck-I. First light was successfully achieved in June of 1993.